Here is syllabus of the senior officer of Nepal Khadya Sasthan (Nepal Food Corporation) which is taken from the official site of Nepal Khadya Sasthan (Nepal Food Corporation). Use Download Button below to download Nepal Khadya Sasthan Syllabus Senior Officer Level 7 or you can read online also. We request to check the official site for any changes and updates of Nepal Khadya Sasthan Syllabus. 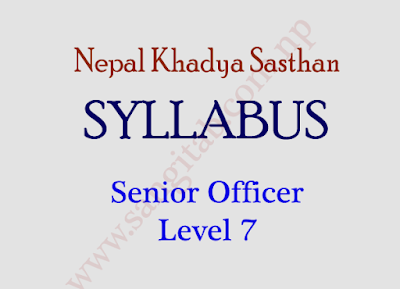 Nepal Khadya Sasthan Syllabus Senior Officer Level 7 read online.